Egyptian and Libyan authorities have been criticised over their response to the murder of Egyptian Copts in Libya earlier this week. Seven bodies were found on a beach in the Benghazi suburb of Jarhoutha on Tuesday. They were shot in the head in what Coptic Solidarity described as “execution style” . In the Egyptian Daily News, President of the Protestant Community of Egypt, the Reverend Safwat Bayaadi, criticised the lack of action from the authorities in both countries, saying the attack “has passed as though it never happened”. The head of the Coptic Church in the UK, Bishop Angaelos described the killings as “very disturbing”. He said they had been told little by the authorities about what happened to the Copts. “We haven’t heard very much. There isn’t anything substantial that’s been shared, or any substantial steps that we’ve seen. They may be happening in the background but we haven’t been informed of anything,” he told Christian Today. The Coptic Orthodox Church in Austria condemned the attack in the Egyptian Daily News and called for greater co-operation between the Egyptian and Libyan governments to increase protection for “simple people, especially labourers”. It said both governments “should exert efforts to tackle terrorists and criminal extremist formations”. Libya’s foreign ministry has condemned the killings and promised that the government will undertake full investigations with a view to bringing the perpetrators to justice. Bader Abdul Ati, an Egyptian foreign ministry spokesman, insisted that “Copts are not targeted in Libya”, and said the crime had its basis in “some criminal motives, in the context of illegal immigration where there is disagreement between the victims and gangs that were trying to smuggle them”. Reverend Bayaadi has questioned this, however, saying in the Egyptian Daily News that “all indicators show that they were killed for their religious identity in an extremist area”. Bishop Angaelos agreed. “Obviously it was a very targeted attack,” he said. Coptic Solidarity warns that anti-Coptic violence is a substantial problem in Libya and that Copts there have been victims of “systematic targeting” by Islamic Jihadi groups it says have been allied with Egyptian counterparts since the fall of the Gaddafi regime. The organisation also attacked the Egyptian foreign ministry’s suggestion that the slain Copts were criminals. “Such false accusations and irresponsible remarks are equally condemnable as the murders because it casts blame on the victims and undermines any legitimate pursuit of justice,” the group said. 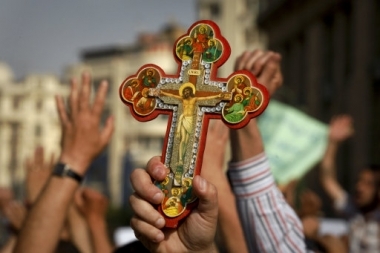 Coptic Solidarity claimed the security agencies were letting terrorists commit crimes against Copts and that security services in Libya had arrested some Christians for “proselytising”. One Copt, Ezzat Atallah, died under torture by Libyan state security agencies, it reports. The group called upon Libya and Egypt to establish a joint investigative commission to bring the perpetrators to trial and pay compensation to families of the victims. The bodies of the victims have since been flown back to Egypt, where they were to be returned to their home town in Sohag Governorate.